Casting is a manufacturing process in which a liquid metal is poured into a mold. Depending on the form of each object, we employ several casting methods such as sand casting and silicon casting, which was self-developed. 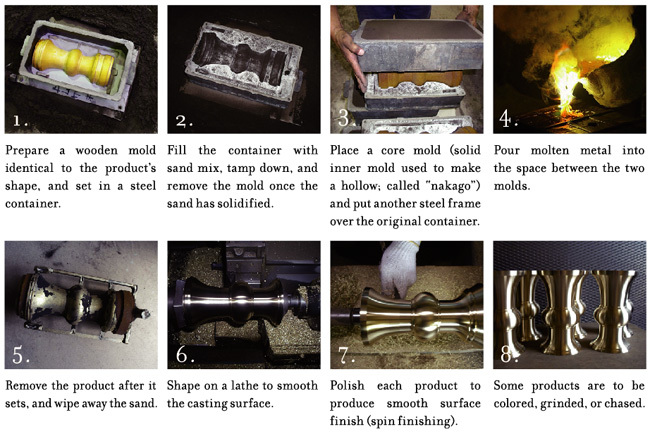 Every Nousaku product starts with the creation of a sand mold, and then undergoes several finishing processes. The simple design and appearance of the products belie a complex and lengthy manufacturing process. Such an elegant design is only achieved by the advanced casting and refined finishing techniques of Nousaku’s master craftsmen. It is normally mixed with other metals in products to increase its hardness, but Nousaku uses 100% tin. It may be a counterintuitive concept, but this idea allows us to accomplish the creation of unique products which can be bent and used. Though tin resembles silver in its whiteness, it does not rust nor tarnish easily. Also, pure tin is significantly antibacterial and safe for serving foods, therefore making it a suitable material for tableware or accessories. In Japan, it has been said that tin removes the bitterness from Japanese sake as well as other beverages. Brass, a metallic alloy made of copper and zinc, has been used for accessories, interior decorations and architectural hardware since ancient times. Brass makes a clear and beautiful sound and is therefore also used for musical instruments, such as horns and trumpets. 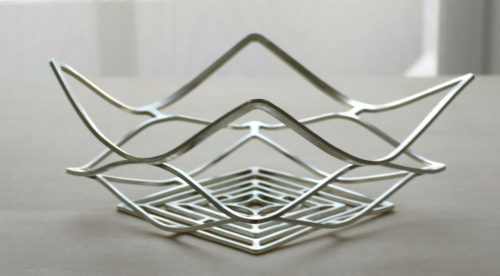 Based on the skilled techniques used to make Buddhist ritual objects and Japanese tea sets, Nousaku creates various interior objects such as bells, candle holders, incense stands and windchimes. 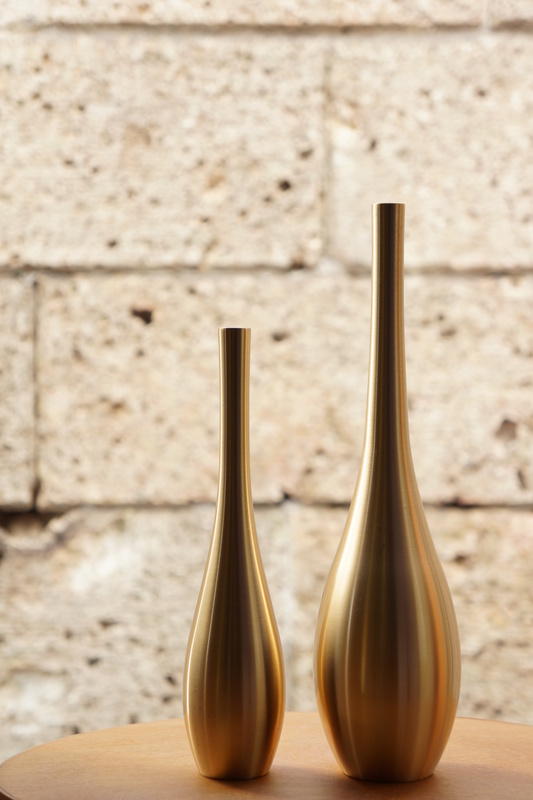 Our brass products are hand-finished by experienced craftsmen, which accentuates their material beauty and fineness. Bronze is an alloy of copper and tin. Due to its hardness, it was used for tools, weapons, armor, and building materials in ancient times before discovery of iron. It also has been widely used for coins, mirrors, vessels, and boat and ship fittings for its anti-corrosiveness. 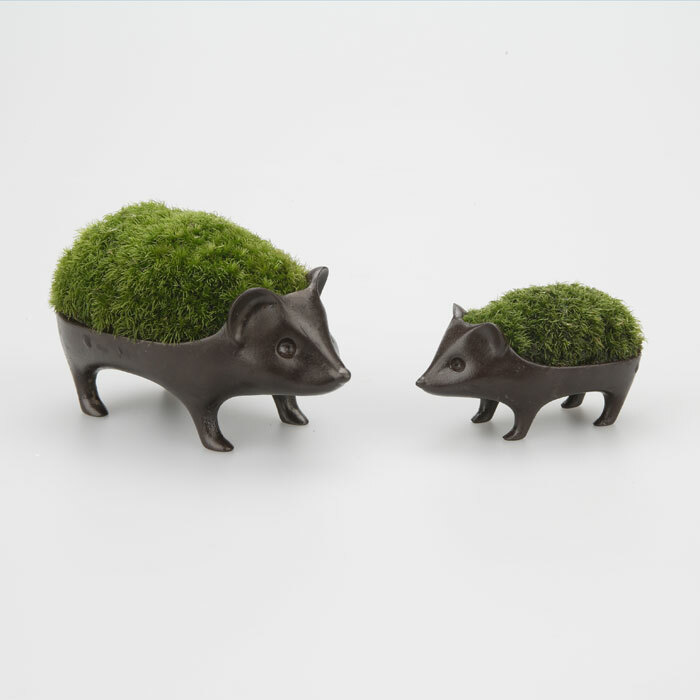 Nousaku employs bronze to produce containers for moss Bonsai, as well as made-to-order construction metal, and art sculptures.